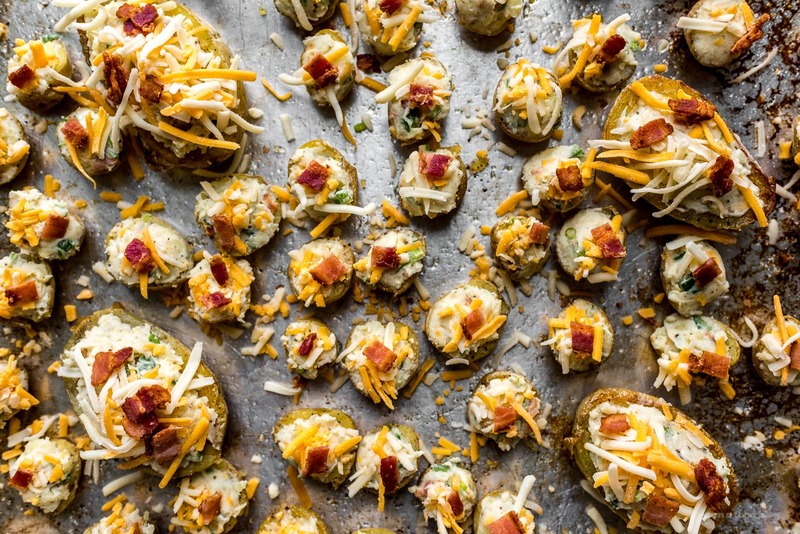 Cheesy, bacon-y jalapeño ranch mini twice baked potatoes! 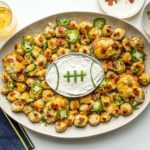 Perfect for big Sunday football game get togethers! It’s almost That Big Game Sunday time and I am unproportionally excited considering that I don’t even follow football. But, this year I know that one team is from Philly and the other one is from New England. 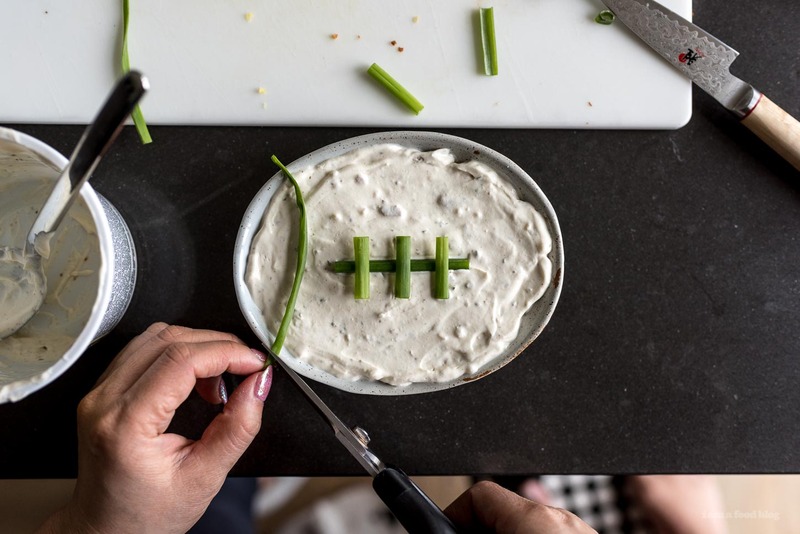 I have to confess, I only know this because I wanted to make some themed snacks and was hoping that I could get some inspiration from the teams. I played around with making Philly cheesesteaks and New England clam chowder, but in the end I went with some good old fashioned twice baked potatoes because I’m obsessed with twice baked potatoes and will take any excuse to make them. But, now that I think about it a bit more, I should have combined everything in one and made some philly cheesesteak twice baked potatoes and clam chowder twice baked potatoes. Darn! Next time, if these teams ever make it to the Bowl again. Anyway, the thing I love most about the game, aside from the snacks, are the commercials. I love the ones that make you feel all the feels – this one is one of my favorites. Oh, and who can forget the puppy bowl? Are you guys going to be watching? Or at least snacking to your heart’s content? 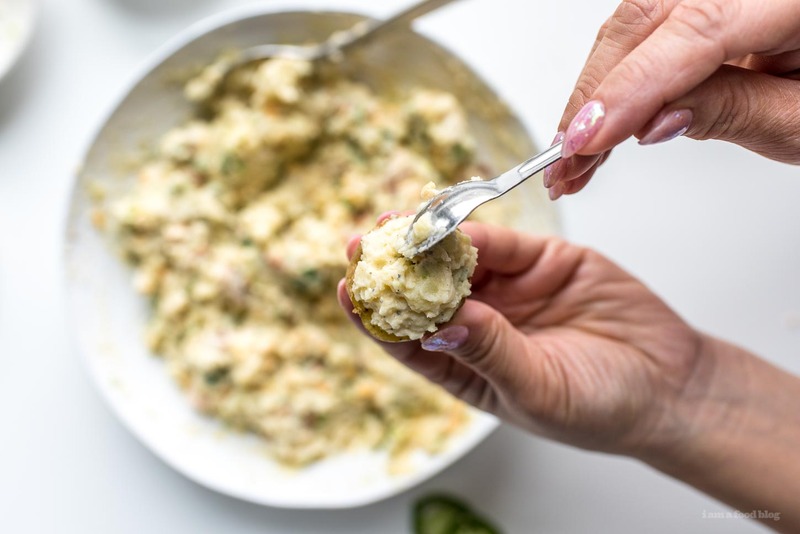 I hope if you are snacking, you’ll make these mini twice baked potatoes. I absolutely love twice baked potatoes. 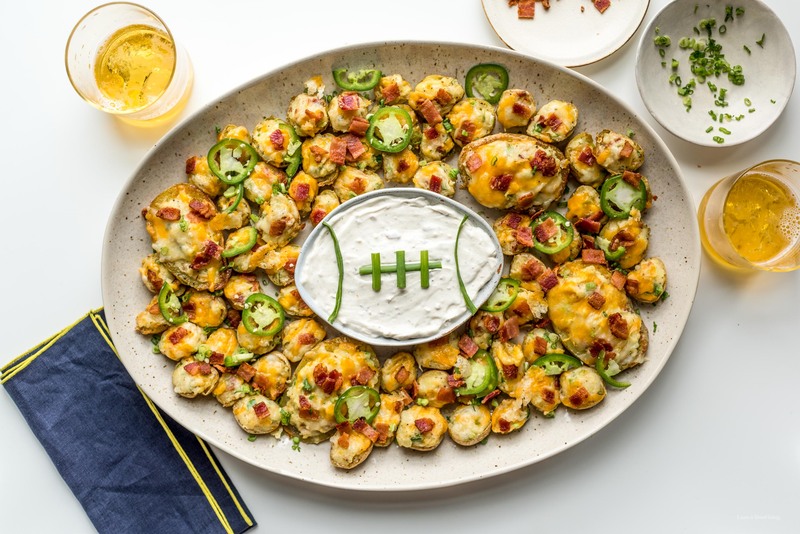 Crispy skins and fluffy creamy insides smothered in cheese? Yes please! 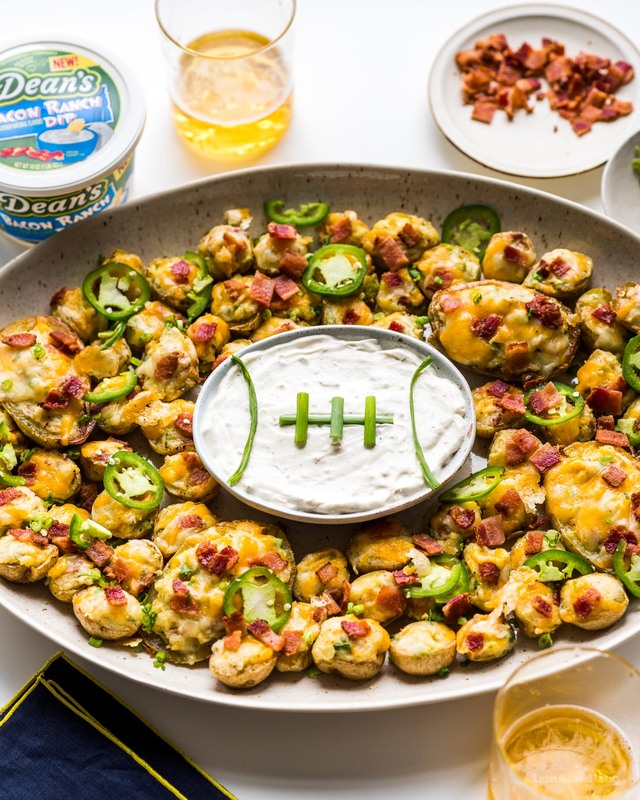 Usually I make twice baked potatoes with cheddar, bacon, and sour cream, but this time I switched it up a bit: I added some diced jalapeños for spice and in a genius move, used Dean’s Bacon Ranch dip instead of sour cream. The result was creamy ranch-y bacon cheese goodness. I cooked the mini potatoes in the microwave because I was in a bit of a hurry, but you can always bake yours in the oven. Whatever you do, don’t forget to poke some holes into your potatoes otherwise you might have a little exploding potato disaster. I also like to crisp up the skins before filling them – this is an extra step and you might think it’s unnecessary but I really love the contrast between crisp skin and creamy filling so it’s something that I think is worth it. Happy game day friends! Hope your team wins! PS – Anyone else watching This is Us after the game!? Lightly fork the potatoes so they don’t explode. Microwave on a paper towel lined plate for 4 minutes, then flip and microwave for 4 more. The potatoes should be tender and cooked through. 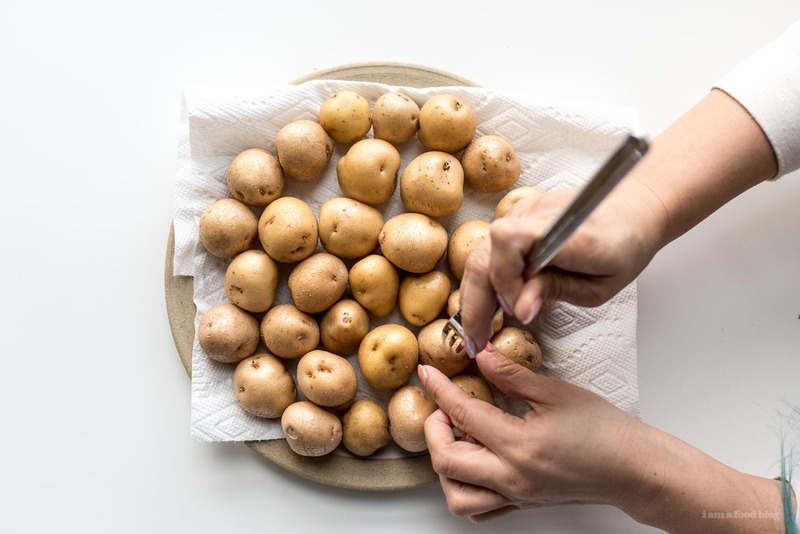 Alternatively, place potatoes on a rimmed baking sheet and bake for about 45 minutes or until tender. While the potatoes are cooking, cook the bacon, then chop it into bacon bits. Grate the cheese, slice the green onions, and mince the jalapeño. Once the potatoes are cooked and slightly cooled, cut in half. Scoop out the insides into a bowl using a small spoon (I used my teaspoon measuring spoon, which was perfectly sized). 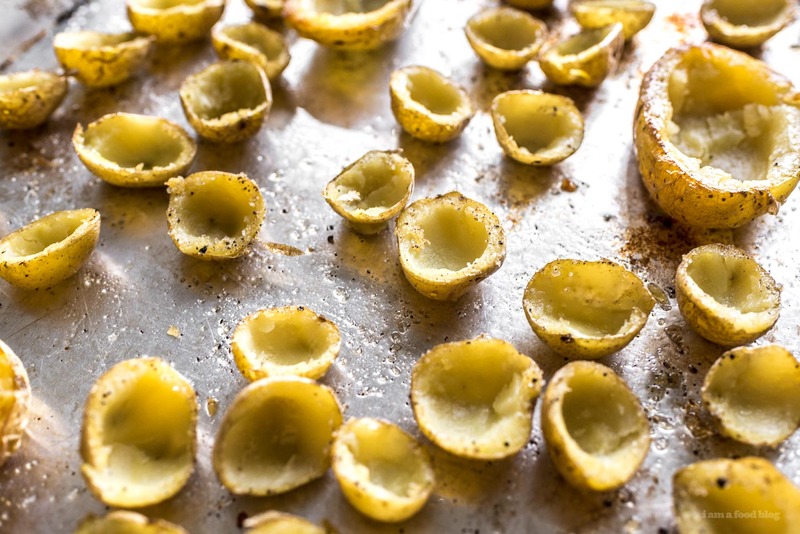 Pour the tablespoon of oil onto a rimmed baking sheet and place the potato skins, cut side down onto the baking sheet. Season with salt and pepper and bake for 8-12 minutes to crisp up while you’re mixing the filling. 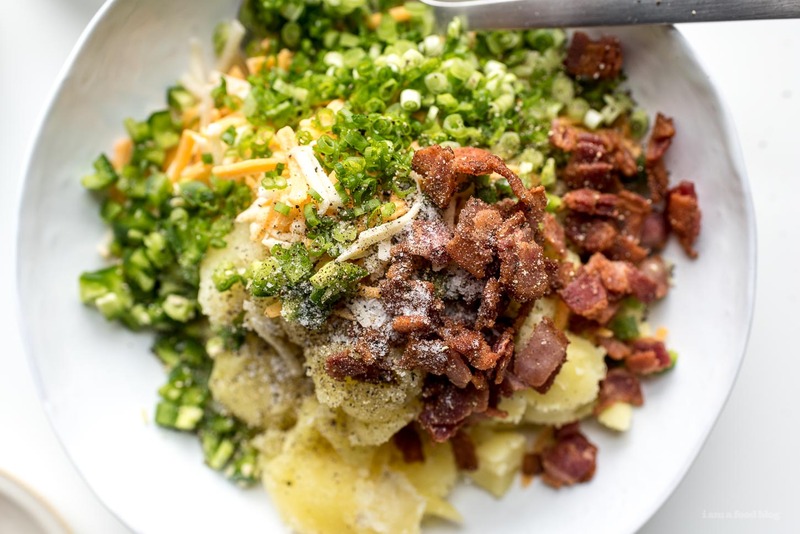 To the potato insides, add the bacon, 1 cup of the cheese, bacon ranch dip, green onions, and jalapeno. Mash gently. Season with salt and pepper to taste. When the potato skins are slightly brown and crispy, remove and fill. Top off with the remaining cheese. Bake for 20-30 minutes or until the cheese has melted into a mass of gooey orange. 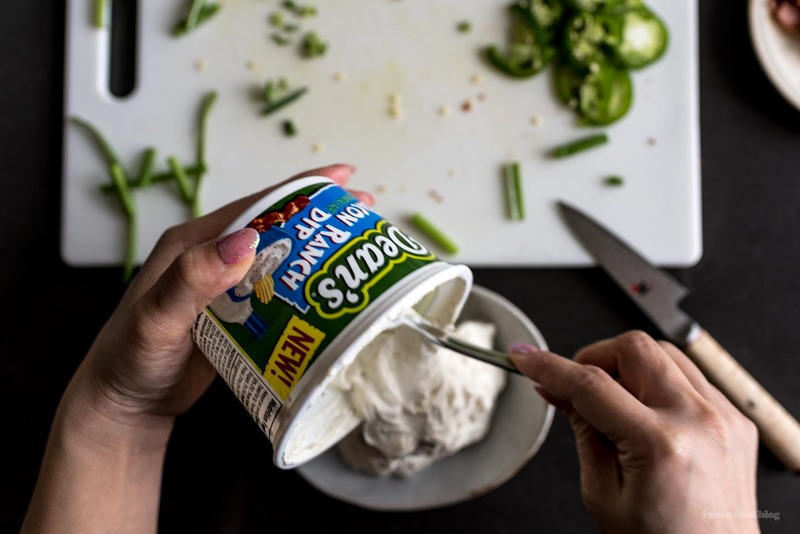 Let cool a bit and enjoy with extra bacon ranch dip. 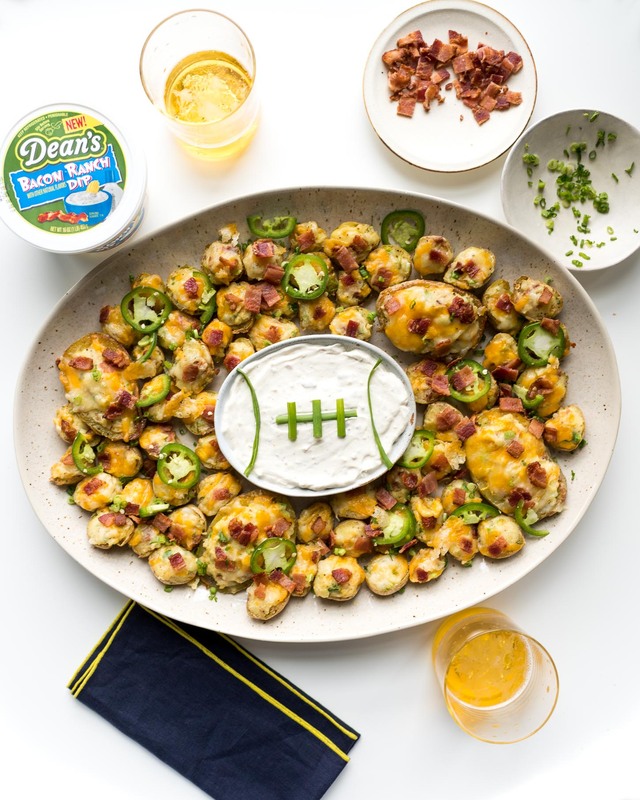 We partnered with Dean’s Dips to bring you this post, but all opinions are our own. Thanks for supporting i am a foodblog!